We got really excited about choosing Sandra Walker because she was so excited about being chosen! She lives on Lake Erie, which she told us in CAPITAL letters when she entered the challenge. We could practically see her jumping up and down. 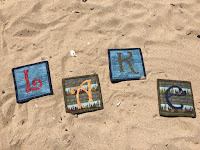 The other really cute thing about Sandra that made us laugh was her blog name: which is mmmquilts.com - simple enough, right? But the name in the heading is Musings of a Menopausal Melon! So her effervescent personality showed through. We sent Sandra some fabric from the Better at the Lake collection by Janet Rae Nesbitt of One Sister Designs at the first of June. She has had a very prolific month of sewing! 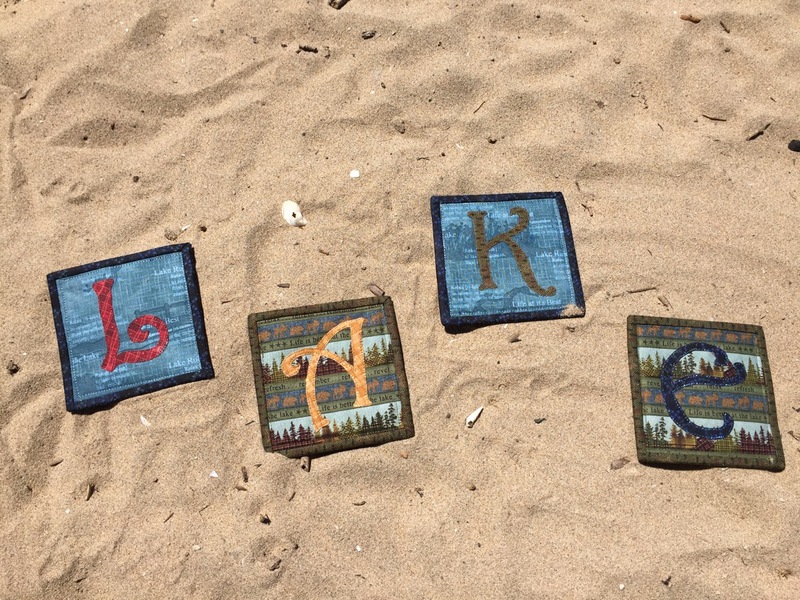 Here is a shot of all the work Sandra has done this month on the shores of Lake Erie. The day her fabric arrived! Quilt in the works...Her own design, called Blue Skies and Sunny Days, now for sale! 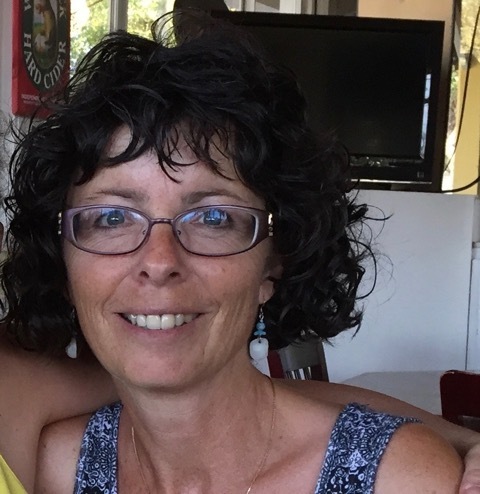 Meet our June Challenger: Sandra Walker. I live in Kingsville Ontario; sitting way down on the 42nd parallel, we are Canada’s southernmost town. The town is right on the north shore of Lake Erie, about a half hour south of Windsor, Canada’s southernmost city. Windsor is the only city where you have to go north to get to the US! It is on the south side of the Detroit River, with our big sister, Detroit, on the north side. Living on a Great Lake means we have a fairly temperate climate; as a result, Essex county is home to 18 wineries, a lavender farm, orchards, multiple greenhouses as well as produce farms, and the best (IMHO) tomatoes and corn in North America. I am fortunate enough to be able see Lake Erie, between some trees and other houses, from my patio. I was born in Alberta, and spent the majority of my life there. My husband is from Essex County, and we spent five years in the 80's living here and both our daughters were born here. We moved back to Alberta to be by family, but a few years ago made a huge life-changing decision to quit our jobs pre-retirement age and move back here and slow our lives down. Our youngest daughter, Dayna, moved here a couple of years before we did, to go back to school. She now works and lives in Michigan. Our eldest daughter, Brianne, and her son, Brady, our almost-8-year-old grandson, live in Alberta. He is the light of our lives, an amazing child. September has become the traditional trip for the two of them to come visit us, and my husband and I take turns going back west to visit them and the rest of our friends and family. I now teach yoga part time, quilt as much as I can, read and walk my beloved ‘pibble’ Rocco. 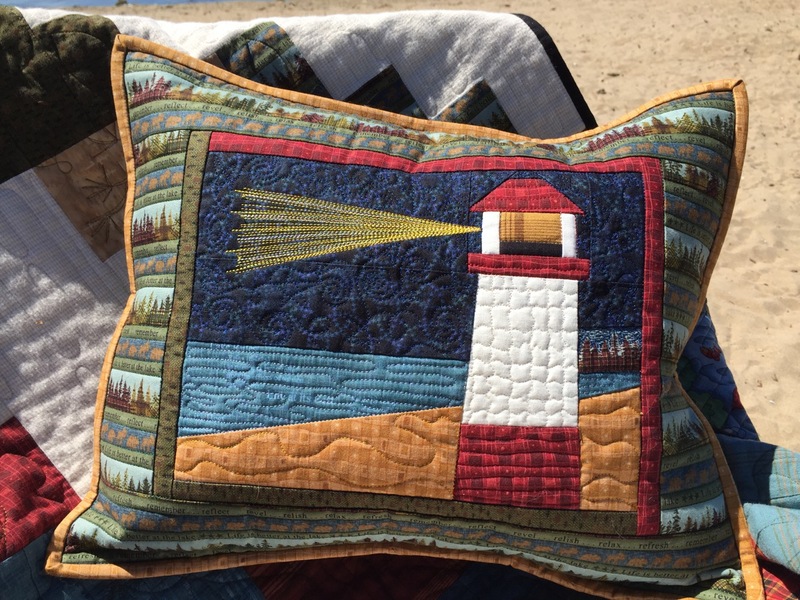 Sandra's own paper pieced block design for the lighthouse pillow. A nod to a few of the different lighthouses in the Lake Erie area. Her own little corner is represented just to the right of the lighthouse. 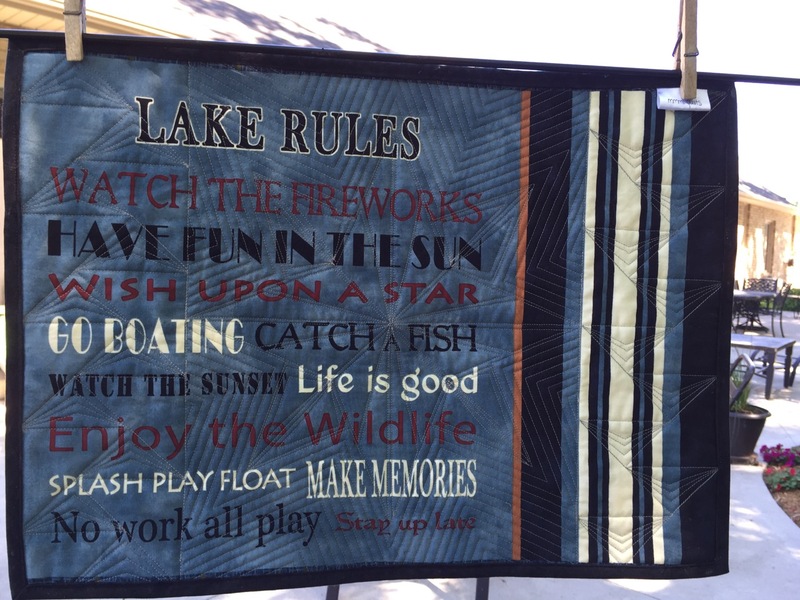 Better at the Lake, on the back side of the pillow too! Although my nana, my mum’s mum, was a talented seamstress and knitter, she didn’t quilt, and so I don’t have a history of quilters in my family. 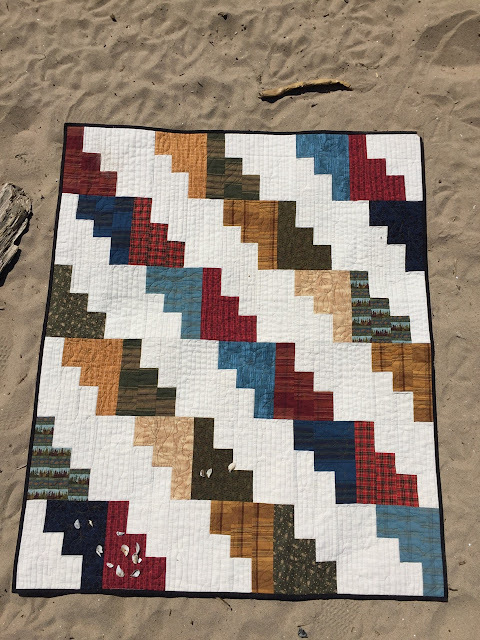 My grandma, my dad’s mum, was a talented crocheter, and she did make a heavy black and red squares wool quilt I remember, that sat on the couch, used for afternoon naps during long harvest or calving time days. I made my first quilt around age 10, for my Barbies. 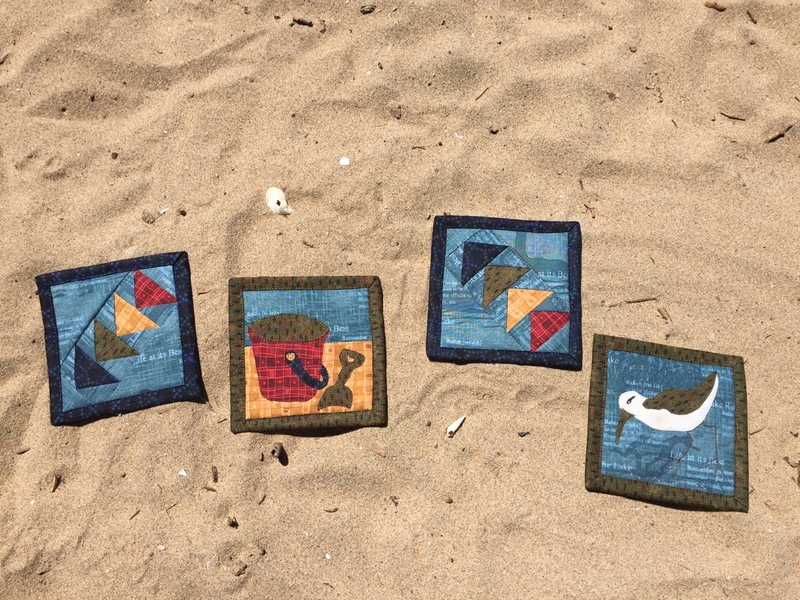 I hand sewed scraps from my mum’s scrap bag (she sewed clothes for us kids) into small squares, stuffed them, and stitched all the little pillows together to make a quilt. It was in 1995, when I went into the local quilt/sewing shop, Lori’s Country Cottage, to buy some fancy lace for dresses I was making for my girls, that Brianne spied a quilt BOM for $1, and made me buy it, “You bring your block back here, and you could win all the blocks, Mum!” Well, wouldn’t you know it, I did. 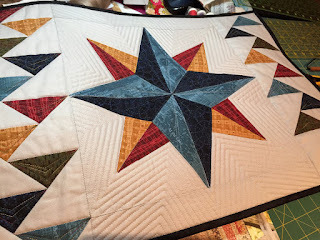 So I had to learn how to put them together, and from there make the quilt, which went to Brianne of course… I, uh, didn’t do much dressmaking after that! 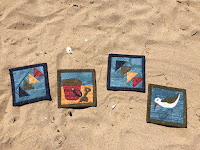 I like all quilts, all sizes, from mini-minis to bed size, both traditional as well as modern design. As for techniques, I enjoy pretty much everything but if I had to pick one for a quilt top, it would be piecing. I LOVE playing with colors and shapes. I’m happiest when I’m rummaging through my stash, which is pretty plentiful I’ll admit, after 20 years of quilting(! ), pulling multiple fabrics to work into a quilt design. I mainly have sewed from patterns, at times altering them to suit my needs, at times combining a couple of designs. Occasionally I have made my own designs, which I’ve been doing a lot more of over the past year, which is very exciting for me! 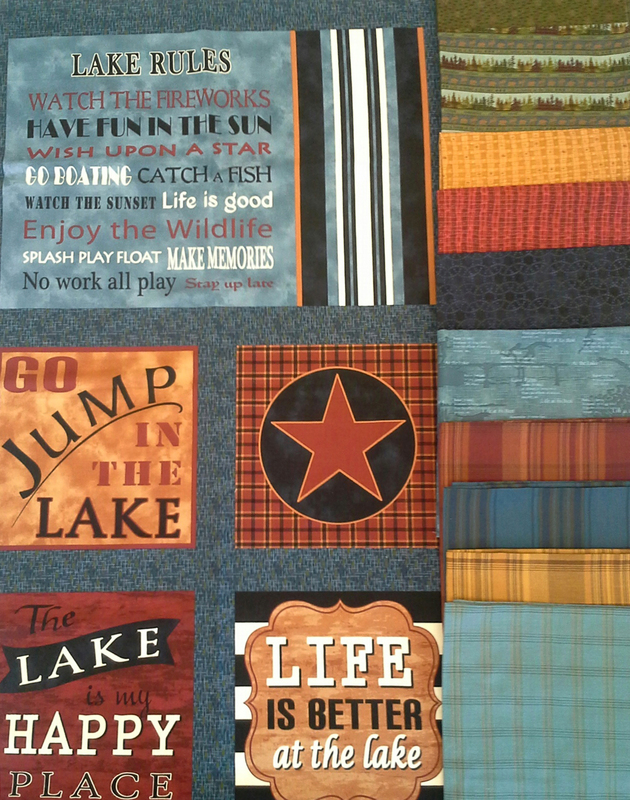 I also just love the quilting part of making a quilt. Seeing Kathy Sandbach on “Simply Quilts” was a huge game-changer for me, showing me I could ‘draw’ with my sewing machine! I saved for a few years prior to leaving teaching, and purchased a barely-used Avanté in 2013. It is so much better than wrestling a bed-size quilt through my Bernina! 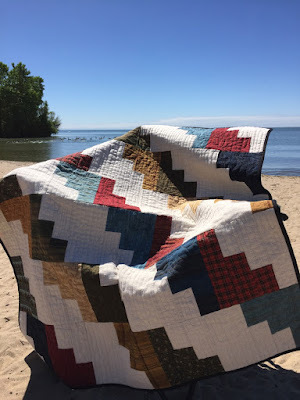 However, I do still love to quilt from time to time on my Bernina; the projects I’ve made for this challenge show both methods of quilting a quilt. Cute Better at the Lake drawstring backpack with Panel Block as the pocket. I started my blog in the Fall of 2013. 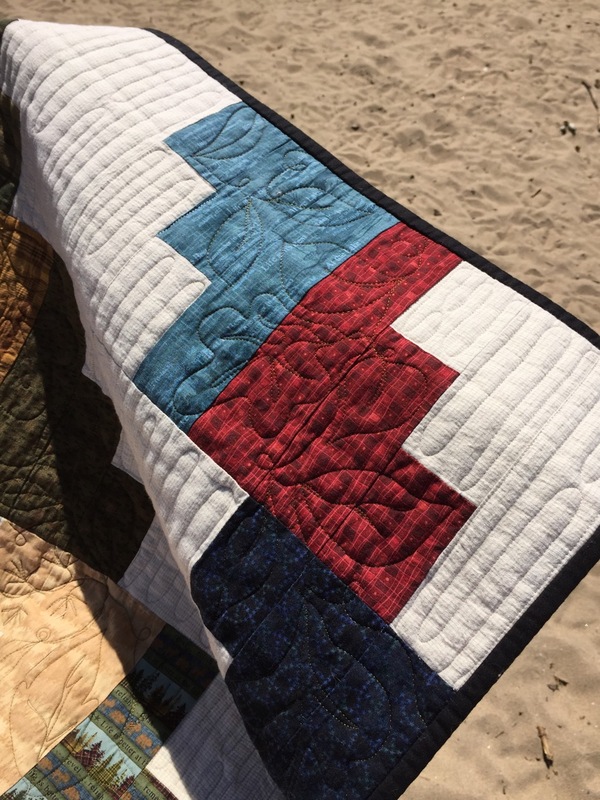 I must say the online community of quilters, something Helen of Midget Gem Quilts and I dubbed QBL, 'Quilting BlogLand', has enriched my life more than I ever could have foreseen. I have friends around the planet, something that binds us (pun intended) together and gives me a sense of global community like nothing else ever has. As well as doing yoga, I think politicians should learn to quilt; we’d have a much more peaceful planet! Finally, about the perfect guy in my life... I’ve been happily married to my husband for 36 years this August. He goes by MacGyver on my blog because he can make anything, from metal to meals, and fix pretty much everything broken, from cars to hearts. 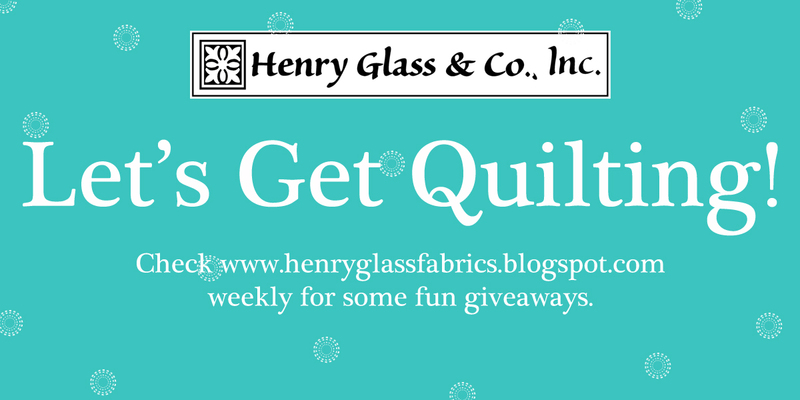 Thank you SO MUCH to Henry Glass Fabrics for the gorgeous fabrics and for trusting me with the challenge of creating something inspiring for other quilters. 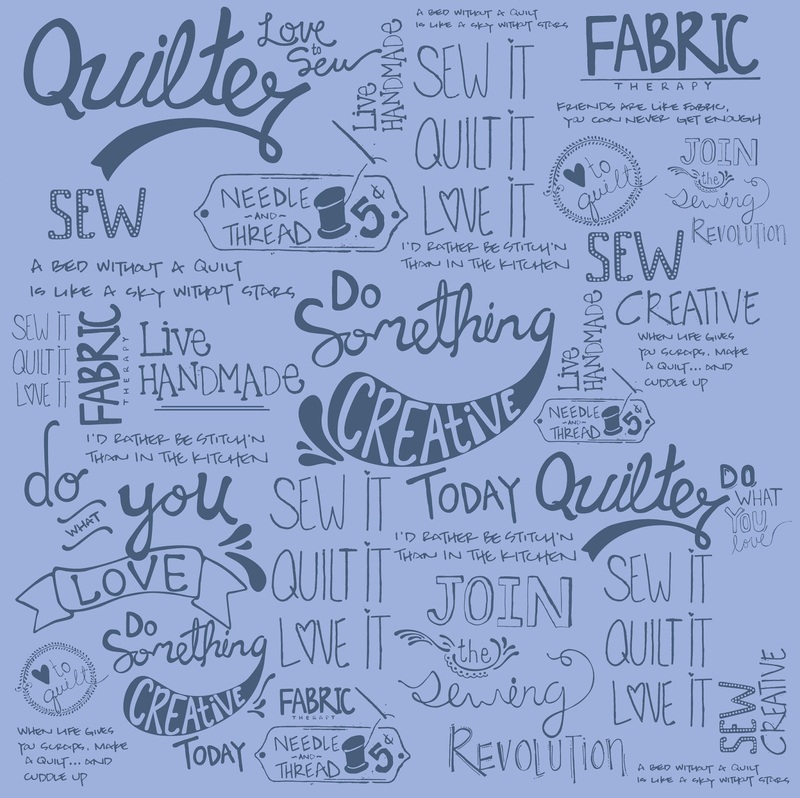 It has been a truly amazing experience; creating a variety of items within the 3-week time limit has made me grow as a quilter/designer! 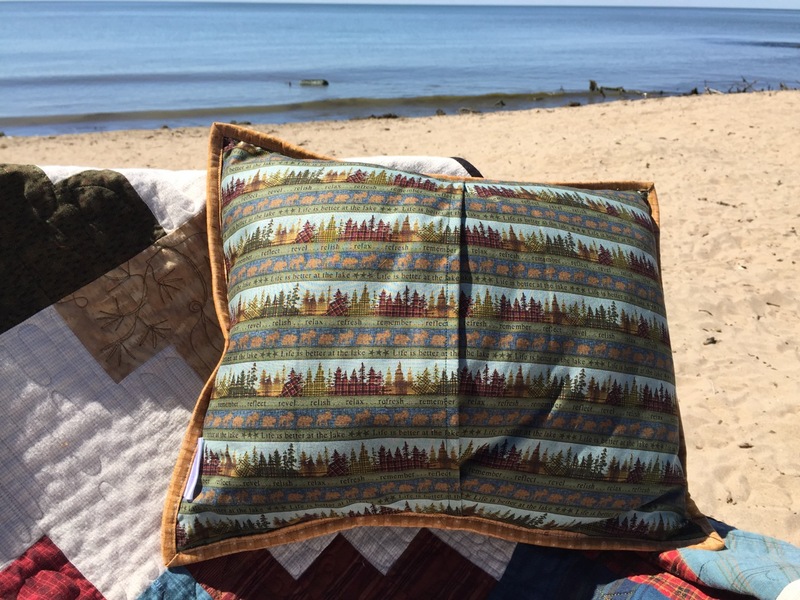 Woodland Cuties is an awesome collection that will be in your local quilt shop in August. To get inspired here is the whole collection. To see a couple free projects made from this collection, here is one of the projects using the panel, and another sweet baby quilt project. Inspired yet? 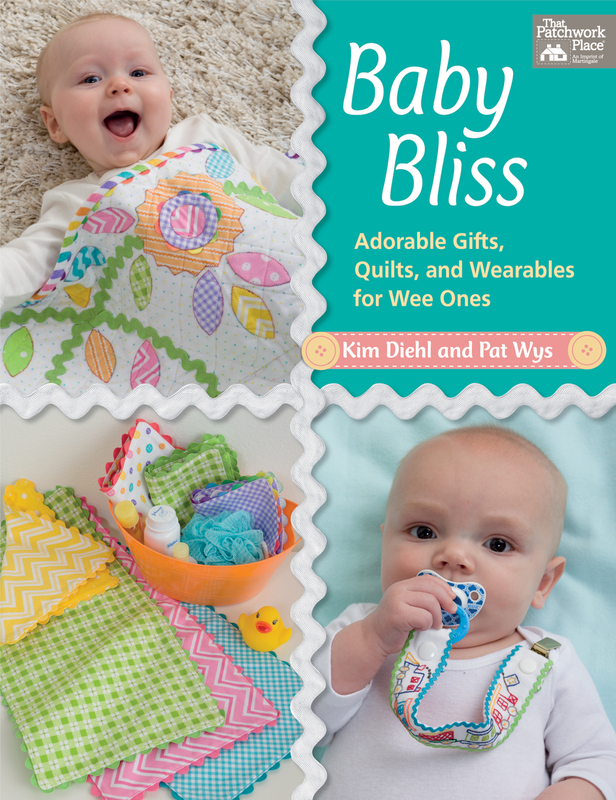 "Baby Bliss" is here and ready to purchase at your favorite book retailer. Grandmas, aunties, and moms-to-be: if there's a baby on the way, you want fast, practical gifts, handmade with love. Be the hit of the baby shower with adorable projects designed by two popular authors and proud grandmothers. Cute, colorful, and grandma approved! 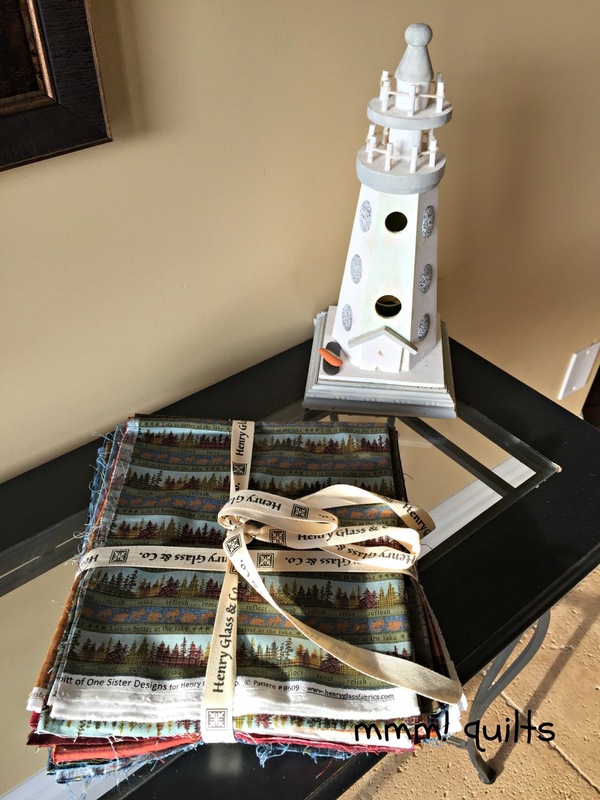 In this book Kim shows off lots of projects using her Ric Rac Paddywack Collection (see below for a giveaway). "Baby Talk" tip boxes offer hints for successful stitching with knit fabric, ultra-plush fabric, ribbon, rickrack, and more. Time to start thinking about Christmas! Here's your chance with this Christmas Elegance bundle from the collection by Jane Shasky of Jane's Garden. Here's a look at the whole collection. You can find this collection in your local quilt shops now. 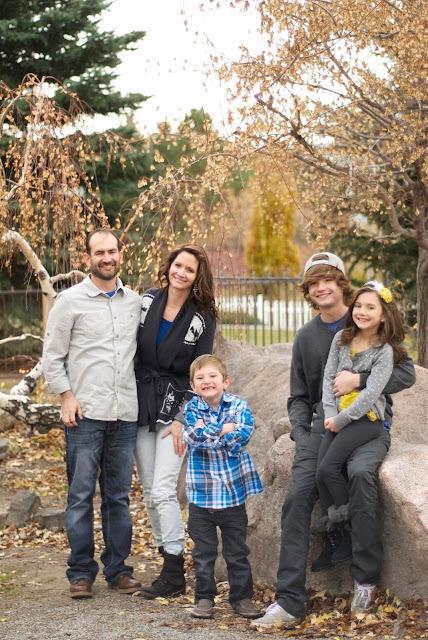 Amy Hamberlin has known the hard knocks of life. In my brief interview with her I came to know a woman who has no fear of following her passions, trying new things, and overcoming any kind of adversity that comes her way. Amy is the owner of Kati Cupcake Pattern Design Co., and has been a fabric designer for Henry Glass & Co. for about six years. Her quilting career began when she first made two quilts when she was pregnant with her first child. She had a Buggy Barn quilt design, and her mother-in-law taught her the stack and whack method of cutting and piecing. Those two quilts were all it took for Amy to become completely enamored with the quilting life. In fact at the age of 27, Amy opened a quilt shop! Her shop was in Rigby, Idaho in a home that was over a 100 years old. She had her shop for 5 years, and when baby #2 came along, it was too much to raise a family and manage the shop so she closed it in 2010. 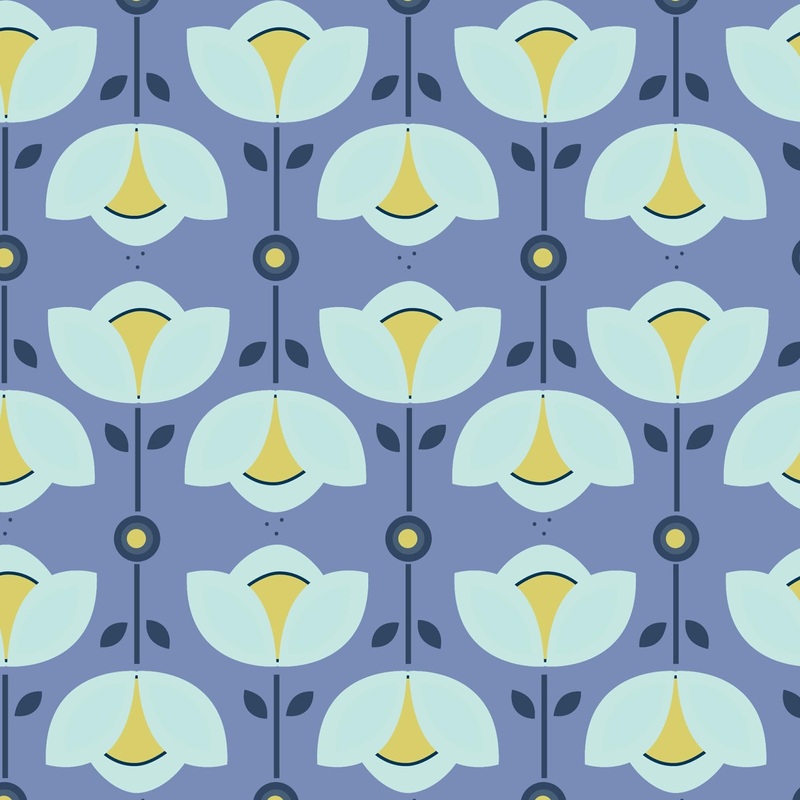 We aren't going to dwell on the tragic in this introduction to Amy, but she has faced some tough challenges, and that's why the flexibility and creativity of being a pattern maker and fabric designer is so important to her. She has had two very serious brain surgeries to quell three meningioma brain tumors. They came as a total surprise, and it is a condition that has to be constantly monitored as there are other benign tumors still there. Needless to say, Amy has a huge appreciation for life. "I don't take any day for granted," she says. "Tomorrow is a gift, so live the best you can today." 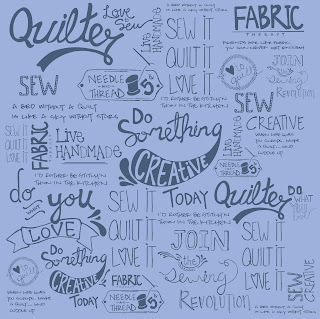 Amy's latest fabric collection was launched in May, and it's called "Sew it - Quilt it - Love it", and it features one of Amy's latest interest; typography, or hand illustration. In an example of what seems to show off her determined character, Amy taught herself to work in different mediums; a variety of pens, types of inks and pencils to create typography, knowing nothing about it before she started. "Typography that I have designed is so personal, and it looks great in a quilt." 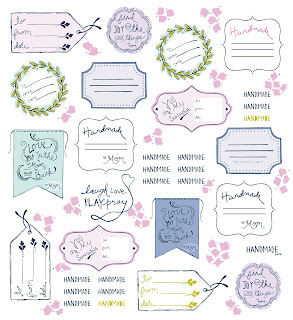 "There is also one design in the collection that is all of my hand lettering for labels. The personal touch lasts a lifetime, and making it personal is the best thing you can do to a quilt, especially one that is a gift." Her other love is pattern making. 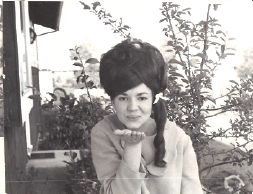 Kati Cupcake Pattern Co. was named after her own mom, who died when she was just 23. Pattern making is great therapy. 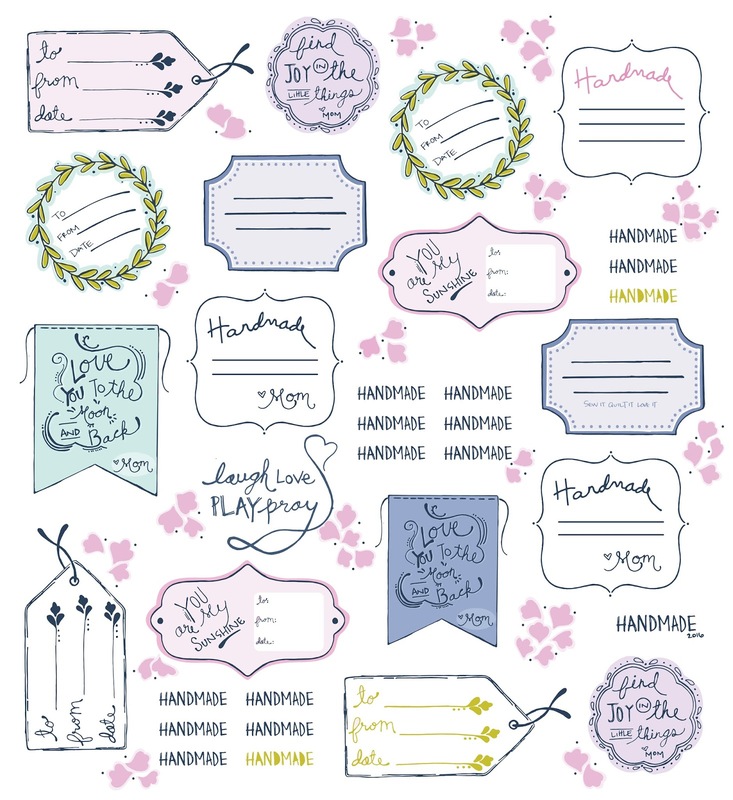 She introduced two new tote patterns at Quilt Market in May under the Kati Cupcake Pattern Co. label. "Designing patterns helps my thinking be clearer, more concise," she says, "And quilting and sewing is just plain therapeutic." Amy's mom- Kati, whom Kati Cupcake is named after. It was a pleasure catching up with Amy, which is hard to do these days. She is currently spending life going back and forth from Atlanta where her hubby is on a two-year assignment, to Idaho where her family (and her design studio) calls home. It is so wonderful to meet someone who is truly a grateful and thankful overcomer, and Amy Hamberlin is all that and so much more. It's Monday! Time to get in on the action with a Kim Diehl fabric giveaway. Kim's latest book Baby Bliss will be launched on June 22. So you will be ready if you are the winner of this contest! 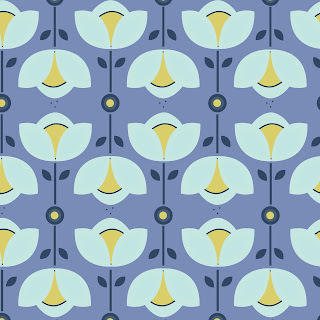 In the meantime, you can always see our FREE PROJECTS using this fabric on our website. Monday! It is sadly not a holiday. Did you miss us last week? Yes, we took Memorial Day off. It is good to take a day in remembrance of our military. Three cheers for our troops! We have something SUPER special in store for the giveaway this week. 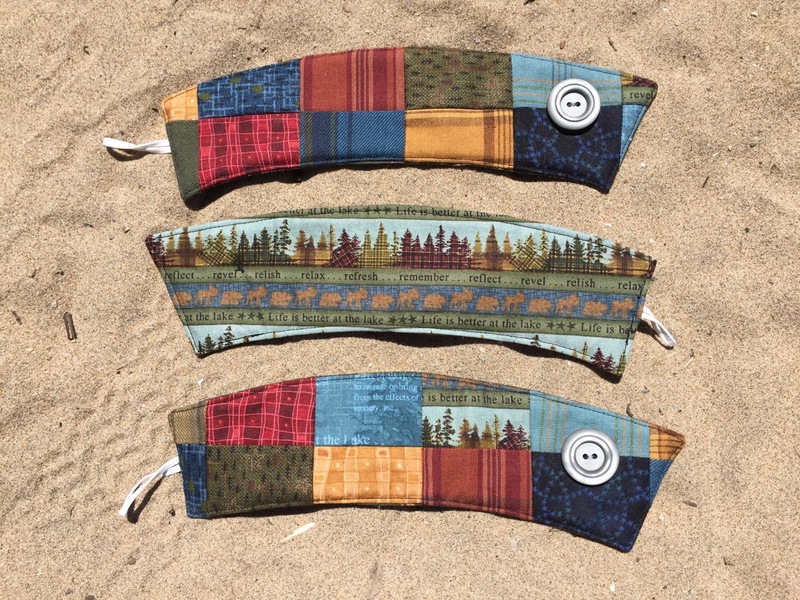 Up for this weeks contest is a few fabrics from the collection called A Prairie Journal by Martha Walker of Wagons West Designs. 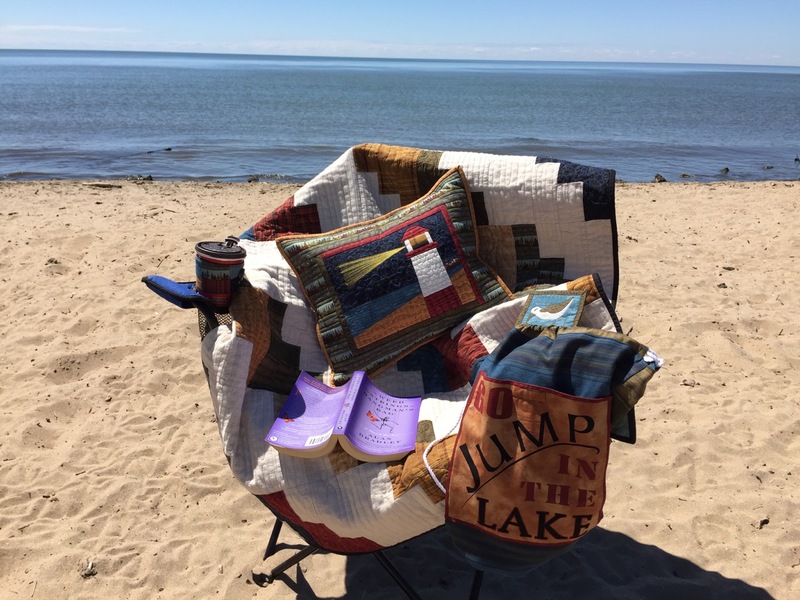 Sandra Walker had us with "I live on Lake Erie, and see the lake everyday." Sandra has entered her name as a candidate every month since January (see everyone...it just takes time). 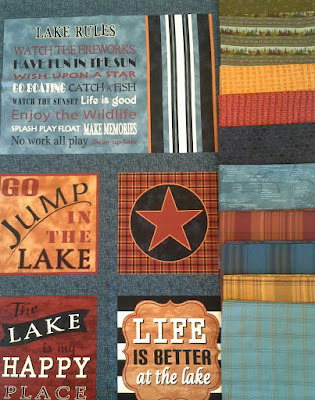 We are looking forward to seeing what Sandra can do with the Better At the Lake collection by Janet Rae Nesbitt. Thank you to everyone who took the time to throw their name into the hat...remember, don't give up! It's summer time, and leisure thoughts seem to automatically drift to spending lazy days near the water. Lake, beach, or ocean doesn't really matter. It's a better life. 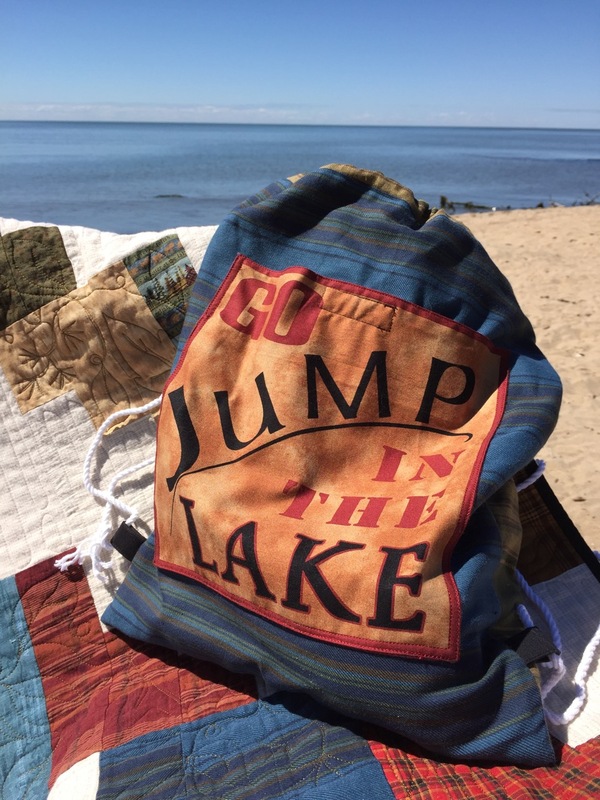 This collection, 'Better At the Lake' by Janet Rae Nesbitt of One Sister Designs holds marvelous inspiration for the folks who are ready for an escape at the lake. 4. 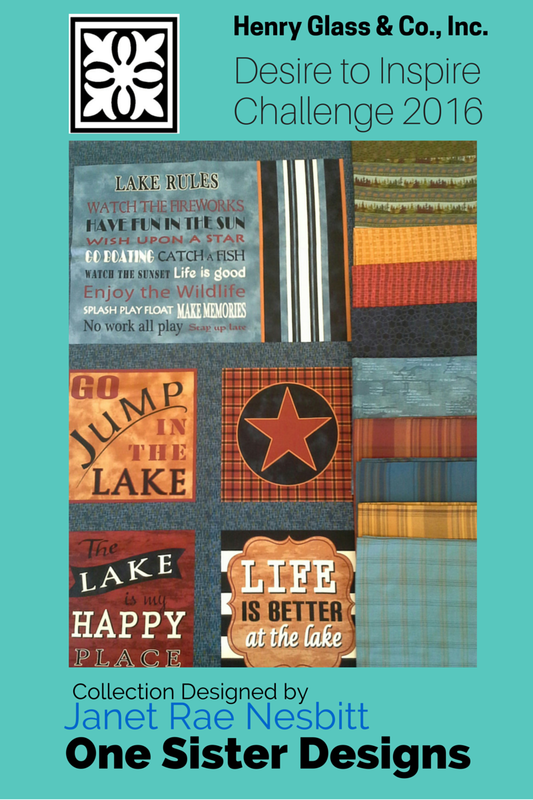 WE send you 5-6 yards of the "Better At the Lake" fabrics. We will choose the Challenger and send fabrics out this week! Your post will be scheduled for June 30.